Say your final farewell to a loved one with this exquisitely vibrant, unique flower display. 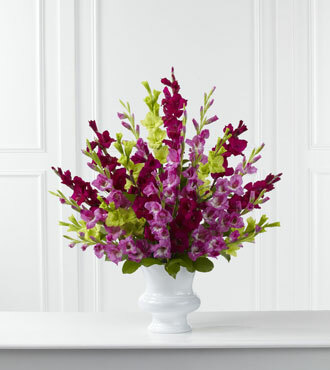 The FTD® Solemn Offering™ Arrangement is made up of breathtaking fuchsia, magenta and jade gladiolus, gathered fresh by our floral experts and artfully arranged with fresh greens in a smooth, white urn. Available for same-day delivery, this bouquet is stunning and will surly create a lasting impression for friends and family who recently lost someone dear. GREAT arrangement includes 25 stems. Approximately 34"H x 34"W.
GREATER arrangement includes 31 stems. Approximately 35"H x 35"W.
GREATEST arrangement includes 37 stems. Approximately 36"H x 36"W.